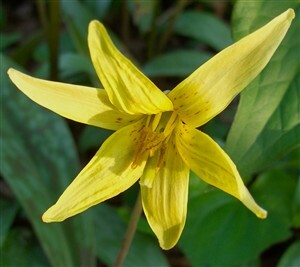 Erythronium americanum (flowering form) A fast clumping stoloniferous species with narrow, glossy marked leaves and lemon yellow nodding flowers often with a hint of lime and orange. Very beautiful it can take time to flower but this is a flowering clone (see photo) whereas I have another clone which has never flowered although I have had it for much longer. Flowering can be hastened by growing over a slate. Humusy, moist soil in part shade.